No, salads are simple, scrumptious eats because they feed the soul with the goodness of freshness and deliciousness. Honestly, I enjoy eating any and every kind of salad, however, in the last couple of months I have come to love making my salads with fresh ingredients straight from the farmer’s market. Just pure ingredients from nature. In this same fashion, I dress up this salad very lightly. Nothing major; just a sprinkle of salt and pepper! And today I am excited to share this recipe with you. I know it will steal your heart and become a winner on your lunch/dinner table as it has been on mine. This plate of freshness makes my soul happy! I love having this salad with hard-boiled eggs. You are free to swap it with any meat of your choice. Now let us simplify this salad thing. Like regular tomatoes grape tomatoes are nutritious and an excellent source of vitamins and fiber. Additionally, tomatoes are helpful in maintaining healthy immune as well as cardiovascular health. I particularly love to use grape tomatoes for most of my salads that require tomatoes because they are manageable and easy to work with. And they are readily available from our farmer’s market. Also, I love the fact that I can use them to make this salad without cutting them open. It doesn’t get easier than that. I love cucumber; this is one of the vegetables I refer to as my hydration system. Did I say vegetable? Cucumber is actually a fruit. Yes, you heard me right! For this recipe, I used my slicer to slice up half of a whole cucumber, and the result was terrific! Cucumbers are low-calorie fruits at only eight calories per serving, but they have tons of nutritional value. Some of the nutrients found in cucumber are said to have anti-inflammatory and anti-cancer powers. The back or peel of this fruit contains potent minerals, if you would, do not peel them off. Are you wondering what pepper is doing in our salad? Well, I like the crunchiness of bell peppers as well as their colors. Fortunately, bell peppers equally have many other health benefits aside crunch and color. Bell peppers are good immune boosters, eye health improver, and digestive health promoter, very helpful for people that are looking to lose weight amongst other benefits. The folate composition of bell peppers makes them essential for pregnant women. My two cents is that you use every opportunity to load up on this vital nutrient even if it is in your salad. Must be remembered that you can never go wrong by adding apples to your salad. They are sweet and crunchy, and can easily blend in no matter the type of salad. I consider apples to be an absolute must for my farmer’s market salad because I usually buy tons of fresh apples from the farmers market so why not? Besides, some nutritional value of apples includes: they are potent antioxidants, and they are an excellent source of fiber. Apples can reduce the chances of developing diabetes, heart disease, and hypertension. The doctor usually recommends that you eat an apple a day. 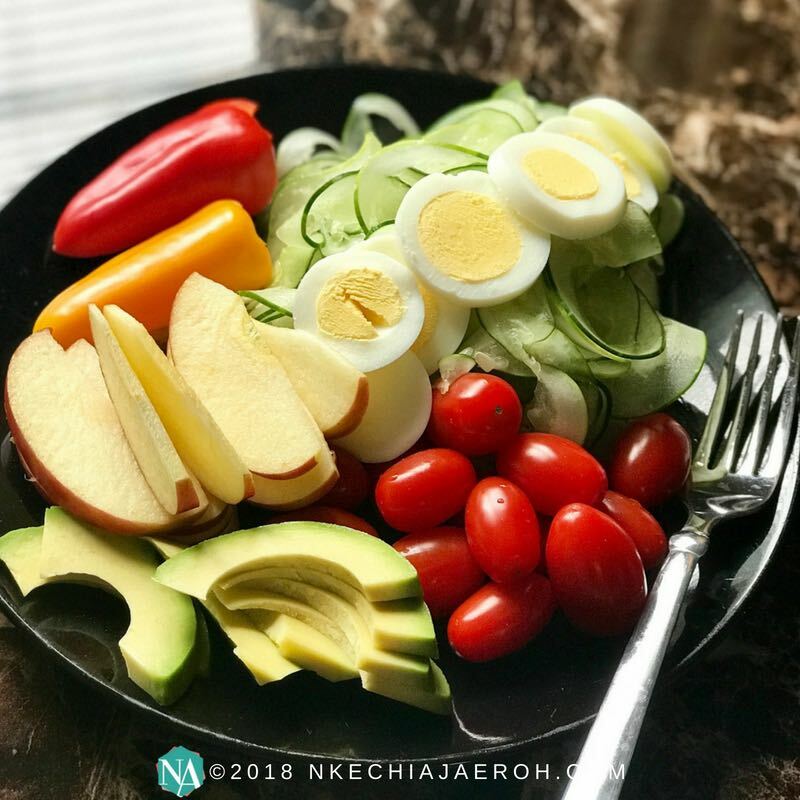 Alongside grape tomatoes, cucumbers, bell peppers and apple my simple, healthy and fresh farmer’s market salad recipe also contains avocado and hard-boiled eggs. A small sprinkle of some salt and ground black pepper makes this whole bowl come together. Do not complicate this salad with heavy dressing. But ultimately be free to enjoy it your own way! Now if you are ready, let’s get it done! You can take this salad a step further by adding your favorite produce from farmer’s market. Make it your way. In a good old bowl or plate, assemble all your ingredients. Then sprinkle some salt and pepper to taste, that's all you need to dress up this salad. And your simple, healthy fresh farm salad recipe is ready! In the meantime, you may also want to check out my other salad recipe here and for all my nutritious light and lovely dishes as well. Please do not forget to SHARE out this post! And if you enjoy all the things I share with you here then I want to personally invite you to join my community, click here to join now and get a gift! Salads are great fun to prepare and wonderful to eat. I love adding a little bit of fruit too for that little extra bit of sweetness. I always miss the local farmers market so I get the market to come to me every week in the form of a veggie box delivery. Now I have seen these pictures I know what I am going to have for dinner tonight! Am excited to see you here! OMG, Yes! Salad is so fun to prepare and eat! The sweetness of fruits in salads is divine. Am glad you are making this tonight, do not forget to let me know how it goes.